The spring game; a game where players can make a name for themselves and us fans get our first taste of Duck football in months. It’s an exciting time for everyone. Yesterday, the Oregon football twitter account has confirmed Saturday, May 2nd as the date for this years scrimmage. With many questions to answer for next year, this will be our first look at the 2015 team. One major thing to look forward too is going to be who replaces Marcus Mariota. If you remember, it was Mariota who shined in the spring game and essentially stole the starting job from Bryan Bennett. Will there be a similar situation this year? Personally, I don’t believe Jeff Lockie will be the starter. I’ve said many times in casual conversations that he is the Nate Costa of this team; a good guy to have around, but not starter material. So it could be a newcomer who steps up in spring practice and plays well come May 2nd that takes the reigns as the next Oregon quarterback. It’s far too early to tell who exactly will be in contention for the job, but it certainly will be interesting to see how it plays out. Reggie Daniels in last years spring game. Another thing to watch is how the defense will play. Sure it’s only a scrimmage, but we have lost a good chunk of talent to graduation and the NFL draft, so there are spots to fill on the defensive side of the ball. Last year, safety Reggie Daniels was all over the field during the spring game, and he earned a starting job as a result. With Efo Ekpre-Olomu, Troy Hill, and Erick Dargan gone in the secondary, it will be time for new faces to emerge as impact players for the Ducks. Chris Seisay saw some good playing time this season as a redshirt freshman, so he’ll likely be in the mix for a starting corner position for 2015. But who will be the other starter? Who will replace Dargan at safety? Those questions should be answered this spring. The spring game is an exciting time in Eugene. Fans fill Autzen Stadium for the first time since November, and once again football is in the air. 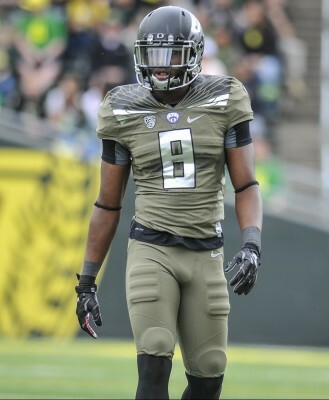 Only 99 days until our Ducks take the field and the new era of Oregon football begins. Be sure to stay tuned in to FishDuck as we move closer and closer to May 2nd. I don’t know about you, but I’m ready for more Duck football.